*Letitia Wright wins EE rising star award (only award voted for by the public). 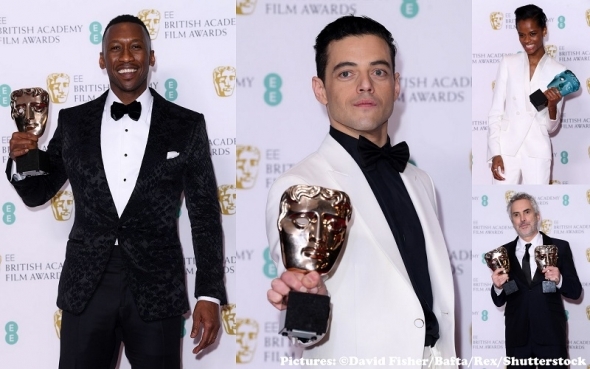 FROM one outsider to another – Bafta winning actor Rami Malek (second left) saluted the memory of Freddie Mercury, the lead singer of group Queen, as he collected his award last night at a star-studded British EE Academy of Film and Television Awards (Baftas). Malek, who has Egyptian heritage, won for his role as Mercury in the rock legend’s hugely successful biopic, ‘Bohemian Rhapsody’. Malek was little known outside the US and was drafted in when Sacha Baron Cohen (one-time Ali G) dropped out of the film, which took more than 10 years to make. Young black Brit Letitia Wright (top right) who had a prominent role in ‘Black Panther’ won the rising star award. She told the star-studded audience she was on the verge of quitting acting and was in a “deep depression”, and recovered only when she was selected as a Bafta Breakthrough artist. Mahershala Ali (first left) took the best supporting actor role for ‘Green Book’, about a classical black pianist and his white Italian-American chauffeur from the other sides of the track in the 1960s period piece. 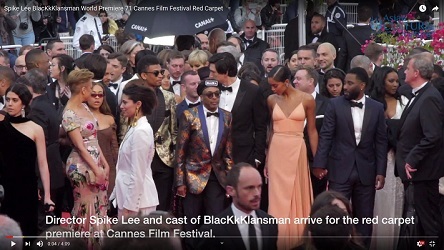 Spike Lee, the director behind ‘BlacKkKlansman’ won his first ever Bafta – for best adapted screenplay. He had never been nominated before, despite having a near 40-year career in film. ACV was at the Cannes Film Festival for its world premiere. (See picture and click please). Indian firm, Double Negative, were part of the team who undertook the special effects for the film, ‘Black Panther‘. Geoffrey Baumann, who headed the four-man group that went up to collect the award, acknowledged them in his acceptance speech. In November, ACV interviewed Double Negtive head Tim McGovern – who holds an Oscar (see video link below). Elsewhere, Alfonso Cuarón’s tale about a domestic maid in ‘Roma’ took the biggest prize of the evening – winning the best film award and upsetting the prediction that ‘The Favourite’ would take a clean sweep of all the major awards – it won seven in all on the evening. ‘Roma’ which is a Netflix film finished up with four awards in all. Cuarón made the most political speech of the evening, saying that film could help to heal divisions and reduce tensions and strife – by helping to understand the human connection. He said: “To see a film about an indigenous domestic worker embraced this way in an age when fear and anger propose to divide us means the world to me. Riz Ahmed presented one of the Baftas. Sandhya Suri lost to 73 Cows’ in the British short film category. The awards ceremony took place at the Royal Albert Hall in London on Sunday, February 10 2019.